Elsa and I are just back from a huge, really early exercise outing. As most of you know, exercise is very important to me. Both for myself and for Miss Elsa. We rarely take a day off because it is that important for us to stay in shape. Anything physical that you do in life is made easier when you are fit; and that goes for our dogs. On our walk today we gave the new Hi & Light Ruffwear harness a try, and WE LOVE IT. Elsa has worn the Front Range harness for a long time now; so when I saw the new lighter version I wanted to try it out. The very first thing I noticed when the harness arrived was the packaging, no struggling to cut ties or pry plastic to get it out. There are three slats on a recyclable card where the harness fits in nicely. Easy to get out and toss the cardboard in the recycle. Nice. The next thing I noticed was the snaps on the harness. They are smooth and not threatening as far as the pinch factor. I can't tell you how many times I've pinched my fingers in snaps over the years. They are a breeze to do up and so smooth. 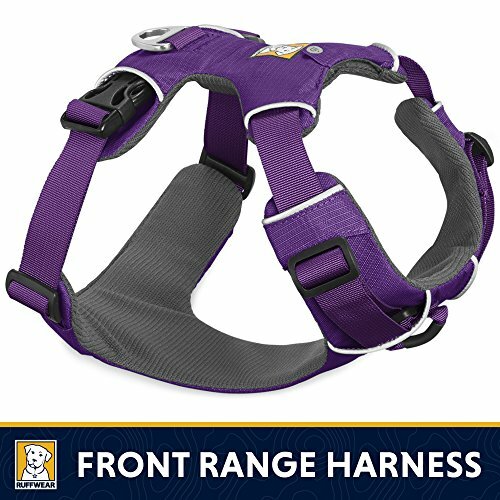 The Hi & Light harness is lower profile than the Front Range . It has one leash attachment on the back and 4 points of adjustment so that you can get a really great fit on your dog. I adjusted the harness on Elsa in about a minute. It is sleeker than the Front Range with a debris resistant liner inside; which is great for dry, brushy seasons like now and the fall. It comes in three colors: blue, gray and red/orange and sizes from XXXs to large/x large. Elsa wears a medium and it fits like a glove. She is 24.5 inches tall and a 45 lbs. Like the Front Range harness, the Hi & Light is easy peasy to put on and take off. It pops over their head and does up on both sides of their chest. Taking it off can be done one handed which is how I typically do it as I often have stuff in one of my hands. I love harnesses, they are my canine/human attachment device of choice. For dogs who are very active on their walks, it's even more important to wear a harness in my opinion. 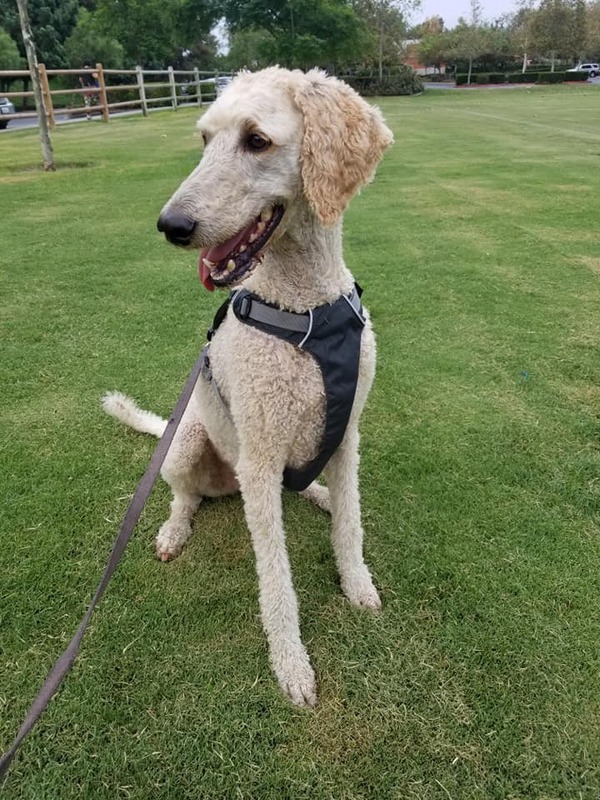 Another great thing about the Hi & Light harness is that it does have less material to it; and for times like now when the temperatures are soaring is was nice to have a lighter harness on Elsa. The harness is very light; easy to carry in your pack or purse even. This will be a second "go to" harness for Elsa and I. She was extremely comfortable wearing it and that of course is one of the most important factors when choosing a harness for your dog. Counter - something that is opposite or contrary to something else. Conditioning - a process of changing behavior by rewarding a subject each time an action is performed until the subject associates the action with pleasure. Counter conditioning is a highly effective way to alter a dog's response. It is commonly used to change how a dog reacts to a specific stimulus by changing the meaning of it. Example: Your dog is terrified by the vacuum cleaner. Every time you try to vacuum your dog runs for the hills, hides under the bed or behind the couch. Like most rehabilitation type behavior modification, baby steps in progression should be used to best facilitate success. Depending on your dog's response you may want to start by just bringing the vacuum out of the closet or just open the vacuum cleaner closet. Then link an enjoyable activity to it. Maybe the closet door opens and you pull out your dog's leash. Maybe it means feeding time or time to play catch. This should be done until you are seeing a positive response from your dog. Next would be to pull out the vacuum and create the same activity - feeding, playing, walking. etc. The goal would be - each time you pull out the vacuum, your dog associates it with something wonderful. You start small and slow, only moving on to more intense work with complete success at each stage. Like desensitizing, counter conditioning is about association. Counter conditioning is typically used to re-associate the stimulus that causes a fearful or stressful response. It is on e of most useful tools in positive behavior modification. Ready to give up? Dealing with an out of control trigger? You can fix it. Read on. Desensitize - To lessen the sensitiveness of. To make indifferent or unaware. Many different things can become sensitized for our dogs. Particular items like leashes, toys, shovels, cars etc. etc. Sounds can become sensitized; thunder, door bells, food pouring in a bowl, packages being opened etc. etc. The moment that we need to step in to desensitize is when the response becomes a problem. This is a very common issue with dogs, no matter what the cause. When a fear response is exhibited due to a sound, item or activity, we typically use counter conditioning which is different from desensitizing. I will discuss counter conditioning in the next blog. Today's blog is about desensitizing which is usually used for an over excitement issue. I am going to use the leash for my example. The leash often results in a severe sensitivity caused by the whole "going for a walk" thing. Dogs love going on walks, most do. So when a leash is a trigger for wild and out of control behavior we need to step in and fix it. I have had many clients who had a big time leash sensitivity causing them to race around the house like an out of control maniac resulting in a very frustrated guardian who cannot get the leash on their dog. The goal with desensitizing training is to make the leash less of a trigger. The way you do that is to pull it out often with no response. Mix it up, pull it out and throw it on the floor, walk away. Pull it out right before your dog's mealtime. Pull it out and go outside. Pull it out, hook it up to your dog and go no where. Your goal is to make the meaning of the leash less powerful. By bringing it out often and creating a different meaning of the leash being out it loses its crazy out of control power. The more mundane the leash becomes the less power it holds. Soon the leash coming out means a lot more than just a walk; your dog never knows. This is how you desensitize things like the doorbell, pulling out the food bowl, a noise making item or any other item or sound that causes a loss of control. Out of control is never a good state for any dog to be in. Make sense? Questions? Leave me a comment! We were out as the sun came up this morning. Hearing about our impending heat today, Elsa and I head out to the park early, before the heat hit. Like myself, Elsa needs to workout strenuously daily; so I love when I can get her power run in before the day starts. Today's run was a quiet one, as we were out before most others, nice. As we were ending our walk we ran into a woman and her 5 1/2 month old yellow Labrador. From far away I could see his rambunctiousness and that he was quite a handful for his guardian. Elsa watch carefully and I watched her intently. As we got closer I could see the question coming from the human on the end of the puppy's leash. "Can he meet her?" the woman asked. I'd been monitoring Elsa's body language well before they were upon us. Elsa LOVES puppies. But, she is very wary of adult dogs because she has been attacked several times. So...I read very carefully before meeting any other dogs face to face. I go with what Elsa tells me, and if it is another adult dog we typically get space and keep on moving. But this morning she told me that she was interested in this little man. 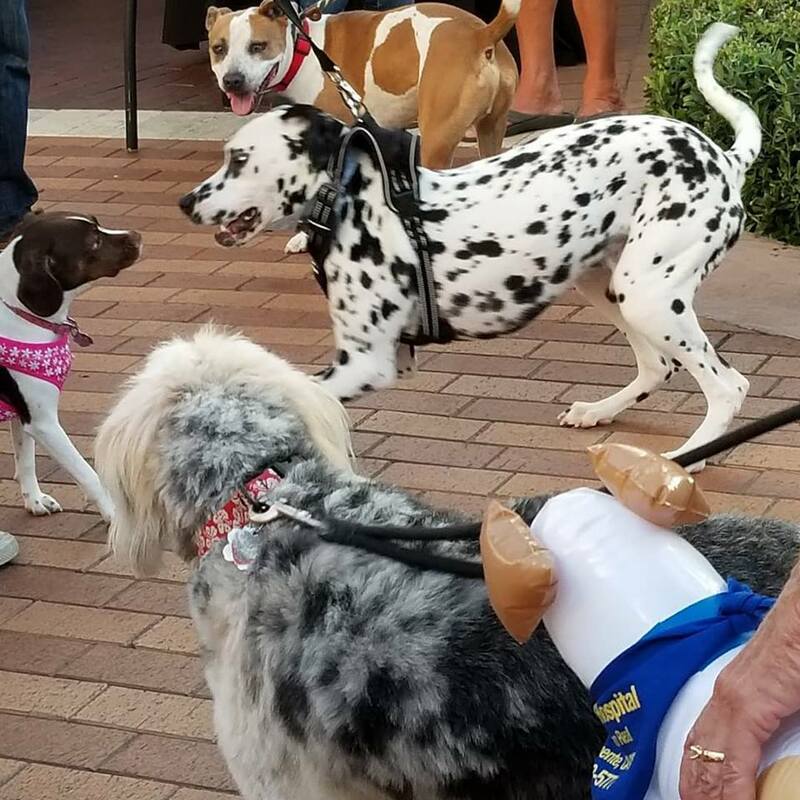 Even though the youngster was exhibiting direct eye contact and straining at his leash to meet her; Elsa knew that he was non threatening. Elsa is probably one of the best readers that I have ever met. She also knows who she wants to meet and this one was someone who she wanted to meet. Her tail was high but not all the way up; and wagging slowly in an excited by not overly excited manner. She reached out to get a sniff and there was no snorting. Snorting is her stress signal that I listen carefully for. I asked how old he was before allowing a greeting. He was 5 1/2 months old and even as large as he was, Elsa knew this before I did. I let Elsa sniff him as he strained at the end of his leash. I HATE on leash greetings. Even the friendliest dog greeting can go wrong if they become tangled. After their first sniff I unhooked Elsa. Watching like a hawk (as I always do) Elsa's body language went from interested, happy and a little tense while on leash; to instantly no worries and calmly excited off leash. The release of tension (unhooking the leash) gave her the freedom to move about, away or closer as she felt the need. Leashes can interfere with body language drastically. Of course there are leash laws and most of the time our dogs MUST be on leash. But it really is amazing to witness the huge change in body language on and off leash. Even though Elsa had clearly shown me that she wanted to meet the young man this morning; she was much more relaxed off leash while interacting with him. She truly is amazing with puppies. So many adult dogs are not big puppy fans; they don't want to put up with their antics. But not Elsa, she much prefers puppies over adult dogs. It always amazes me what she allows puppies to get away with. Even puppies that she has never met before are allowed to push the boundaries that an adult would NEVER be allowed. The puppy bounded around, jumping on her and pawing her with his huge feet. I thought that she might give him a bit of a schooling on etiquette but she just enjoyed his naughtiness. Now... had this boy been her little brother; he'd would have had a great deal of education at 5 1/2 months of agee. Elsa is an amazing teacher with the patience of a saint. Elsa and Forest (little mans name) had a short romp before I stated that we were going to continue our walk. "Quit while you're ahead," one of my motto's in life. They had had a great interaction, so I chose to end it and keep moving along. Elsa was happy, Forest was happy and both guardians were happy. I hope to meet Forest and his guardian in the park again; Elsa really enjoyed his crazy and energetic puppy antics. Dogs are SOOOOOO much more versed in communication than we humans are. We can go on and on with our words without saying anything. But dogs, they speak volumes with their body alone. 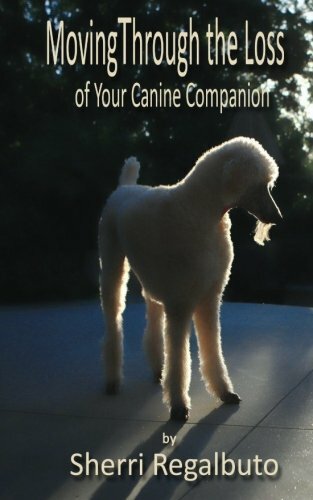 Paying attention to that and knowing your dog is so important when living with dogs. Canine body language is fascinating and telling. Elsa doing a very nice "leave it" for demonstration purposes. The "leave it" exercise is one of the most useful things that you can teach your dog. The "leave it" behavior is typically taught for leaving food items; but once your dog is accomplished at it, you can use it for anything. Personally I have used it for gross items found on the ground during a walk, babies, bees, retrieving items, toys that do not belong to my dogs and so much more. Imagine if you could tell your dog not to touch an item and they didn't. No pulling, no yanking, no yelling? Wouldn't that be the greatest thing ever? Well, it is up there with some of the greatest things ever, for sure. Showing off their "leave it" skills. The "leave it," behavior, like most other behaviors is a progression of steps to get to a solid and reliable response. Once your dog has it down and if you have used it extensively; it is often not needed in certain situations. Dropping food off of the counter, table or hand can become a non issue once they understand that you control the items. The big secret to teaching a solid "leave it" is to reward it. The exercise begins with a low level food item like toasted o cereal (cheerio type). The food that is used to reward the dog should be of equal value. So don't tell them to leave a piece of steak and then give them a cheerio for not touching the steak. They are very smart and will soon be going for the steak faster and sneakier. Makes sense right? Put Cheerio in your open hand and cover with your thumb. They will NEVER be receiving the food in the hand that you have the cheerio. You do not want them to think that at some point they will get the food in your hand. Tell your dog to "leave it" and put your hand out. They will typically try to get the food for a while but do not let them pry it out from under your thumb. As soon as they pull away from your hand for a split second, mark the behavior and reward with a cheerio from your other hand. At the same time pull the lure hand back beside you. Do this as many times as it takes for them to "get" that moving away from your hand is what gets them the reward. This requires a great deal of patience. Be sure to tell them to "leave it" before you place your hand out. Give them a heads up. Try doing it with your hand on the floor, then put the food on the floor with your hand hovering over it. NEVER let them get the item that you have told them to leave. As they become more solid with the "leave it" you can get further and further from the item. Once they are super star professionals at "leave it" you can drop food from your hand and then the counter top; always rewarding them for not touching the item. Don't forget to tell them to "leave it" before dropping the food. Now that they are amazing at "leaving it" you can use it for anything that you don't want them to touch. Remember to only make the exercise harder when they have complete success as each step. Too much challenge can mean failure. Best to take baby steps during the process. We sat waiting for our flight; a flight that should have got us home early afternoon. But there we sat at 4:00pm hoping to get home. My husband and spent a wonderful five days in Cabo San Lucas with great friends and were now headed home. As we sat waiting for our flight I spotted a little cutie sitting on a chair by it's guardian. A small and demure Dachshund that I had noticed earlier in the airport. Her guardian was eating and she (the little dachshund) glanced up to see the food. Her owner quickly smacked her in the face. Not hard but negative enough to create a response from the little dog. She quickly turned her head, ears back and head down. I was appalled by this of course. Honestly, the dog was not allowed to even look her way when she was eating? As I watched the little dog turned her head ever so slightly and used mostly her eyes to sneak a peak. She again got a smack in the face along with a verbal reprimand. The dog was crushed; she put her head down and shutdown. My heart was breaking for the little dog. First off, I think it is amazing when our dog simply look at us when we are eating. Many dogs could actually take our food from us but they don't. In the wild a wolf who is lower in status within the pack will look. They will then be told with a look from the alpha that they are not allowed to have whatever it is that they are eating. A glance is all about communication. Elsa always watches me eat; it is her way to know what she will and will not be allowed to have. The other huge issue that I had with this (aside from hitting her dog) was that the dog was then afraid to look at her owner. There she was in a loud and crowded airport in Cabo; where a big stranger sat beside her, unable to get the reassurance she needed from her owner. She was dying to look up and connect with her owner but was afraid to do so. I wanted to run over and tell her what a good girl she was, because she was. I wanted to lecture the woman about what she was doing; but realized that the middle of an airport in Mexico was probably not the place to do it. She was indeed a "mean Mom" and probably would not be changing her ways because of what I would say to her. There is often so much fallout behavior from one action from us to our dogs. Just yesterday as my husband and I sat enjoying lunch together in Huntington Beach we saw a beautiful young Labrador with his guardian. Just moments after sitting down I witnessed the man grab his dogs lip and pull him into him to reprimand him. Then he grabbed the skin on his back and pushed him into a sit; all because the dog was watching him eat. The whole idea behind "begging" has gotten out of control on our part. Yes, a dog trying to take your food is pretty annoying and should most definitely be stopped. But, a dog sitting quietly watching us eat is pretty amazing and a very natural response from our dogs. Let's look at our dogs as dogs and give them credit where credit is do. If your dog needs training, train positively. We have dogs because we love them; let's not treat them poorly. You don't treat something you love with disrespect. Happy 4th. Last night as we sat enjoying a glass of wine and Elsa was enjoying her rat hunting, the booming began. My attention turned to her immediately as I heard it. Waiting to see what she was going to do; I watched without eye contact. With her attention on a rat that was up in the bushes, she didn't flinch. Here it was, proof in the pudding as they say. The rats were helping Elsa to forget about the fireworks; at least for a little bit. Our reaction to fearful stimulus needs to be calm and chill. The solution to fearful response is counter conditioning. Linking the booming sound to something enjoyable or captivating. With her full attention on the rats hoping around our yard; she paid little attention to the booming in the distance. For a good 10 minutes she was preoccupied by the little rodent. I smiled seeing the evening events unravel before me. The rat had so much power that it was keeping Elsa's mind off of the scary stuff. Nice. After her time of captivation, the booms got bigger. Elsa quietly walked inside and remained there until we calmly joined her. Like every other year I am putting out a warning about fireworks and your dog. Each year many dogs are lost, injured or worse. Fear of fireworks is very common in the species; they don't understand the celebration behind it all. It would be great if we as guardians could explain the booming; but sadly we cannot let our dogs know that it's just sound and sight and nothing more. We can't clarify it for them but we can keep them safe when fear strikes. Don't take your dog to the fireworks display. Make sure that your dog is locked safely indoors. Turn your radio and television on if you leave your home. Be sure that your dog has up to date identification on them. Do not coddle their fear. Try to have fun. If your dog LOVES an activity, try doing that during the booming action. Show your dog that you are not afraid of the fireworks. Get your best "chill" on. Yesterday's walk was once again the spur for a blog. Many times I have to record my blog ideas when they pop into my head (my memory is horrible) but sometimes it just happens on a walk the day before. As we wandered along the pathway of the park; a woman up ahead was yanking. She was blind yanking her dog. blind - unwilling or unable to perceive or understand. yanking - to pull or remove abruptly and vigorously. I see this type of behavior from humans constantly. Said human is out on their walk without putting any attention on their dog. They are not interacting with their dog except for the constant blind yanking. The woman was getting annoyed by her dog's pulling so she pulled back. Think this works? Nope. Have you ever yanked on your dog in attempt to stop them from pulling? They yank, you yank...it goes round and round with no results for anyone. Just annoying on both ends. The dog involved in the yanking on this day was a Shiba Inu. He looked young and rambunctious and was diving in and out of the bushes as they walked. The dog was lucky that he sported a harness and not a collar. But even still he just kept getting yanked, blind yanked by his guardian. This is a really annoying behavior that humans inflict on their dogs. So what are you to do when your dog yanks you? Stop walking and wait. Wait for some slack in the leash and then walk. DO NOT WALK when the leash it tight. It takes some work but typically dogs catch on pretty quickly to this rule. Pull and we stop - Give me slack and we walk. If you are a yanker, please stop. Don't respond to your dog's yanking by yanking back. Teach them, yanking doesn't work; because it doesn't work for either species. Every once in a while I come across a product that I absolutely love and just have to share. So I am sharing my love for these little scissors today. I bought these two years ago and have used them a lot. For the price, they are amazingly sharp and precise. I have used them to groom between toes, around eyes and nose and lots of other small places that need extra safety precautions. I would recommend these for anyone with any breed; and would place them on my "essentials" list without a doubt. With their rounded end, comfortable grip and small size they make tiny snips a breeze. I've even used them to cut gum out of Elsa's paw that she picked up somewhere along one of our walks. Long ago I had a pair of rounded tip scissors but they very quickly went in the trash once I acquired these little guys. The company also has a scissor trimming kit which looks like kinda cool. I have not used it but for anyone wanting to do more trimming without an electric trimmer it could be a good alternative. So for those you would love a pair of i, sharp and safe scissors; these little babies just might do the trick. Sitting in the coffee shop, sipping my organic home brew I enjoy the view from the outdoor patio down by the coast. My seat allows me a great vantage point for people and dog watching; a bonus activity after a business meeting. The sky is overcast which lends itself to more human/canine out enjoying the weather. As I sit savoring the view; a woman walks by with a HUGE mix breed. She is literally being dragged down the street behind her dog. Obviously her monster of a dog is on a mission. It is unclear if the guardian is aware of the mission or not but she is being dragged along for the ride. I hate seeing guardians being dragged by their dog. Why? Because I know that the human part of the team is not enjoying their together time with their dog. With a little training they could both be enjoying the walk instead of just the dog. Even tiny dogs can be a drag to walk if they are doing the dragging. Why do dogs drag their humans on a walk? They drag their guardians because no one ever taught them to walk differently. It is as simple as that. Leash training should start as soon as possible; as soon as you add that little bundle of fluff to your family, it should begin. If you’ve added an adult dog to your family then start with them immediately as well. If your dog already has an ingrained dragging behavior; it will take longer to get rid of but you can do it. Starting today, don’t allow it. This means when your dog pulls, you cease to move. Very literally STOP and don’t move until they offer you some slack on their leash. No cheating, you cannot give the slack, it must be them. So you stand completely still and wait for them to move back, offering the slack needed to keep walking. You can also implement the reward system for loose leash walking. When your dog walks without pulling, reward them. Using tiny little bits of treats, keep them coming. I like to use the “catch” behavior as well. It not only keeps your dogs attention on you, it is a great behavior to fall back on. A dragging dog is no fun for anyone, no matter what size they are. You can start working on it today. Having fun and being active is my main objective. Enjoying the freedom of speed I am also very aware of safety. I wear a helmet and am constantly scanning the environment around me. That includes dogs. Those who love to ride bikes must stay very aware to the dogs around them. I was riding down a path this weekend, where there were folks walking their dogs. I zipped off and on the path when needed; always giving pedestrians and dogs the right of way. Judging the distance of leash guardians had given their dogs and making sure that they knew I was coming; I took the needed amount of space between them and me. I am writing today because I had a few moments with dogs that I needed to address. The first was an area that was very close quarts. As I rode down the path, a more narrow path was ahead of me. At the entrance of the path was a couple with their dog. Their actions made me get off of my bike. They had cornered their dog; the husband put his leg across the dog and the woman had a stick in ready. Hmmmmmmm. This looked like an accident waiting to happen. Clearly the dog was not going to be okay with me riding by. I got off my bike and gestured for them to go ahead. "He loves to run with bikers," they explained as the dog dragged them my way. "I could see that he was focused on me" I said back to them. Before I could scoot around them the dog was sniffing my bike. "How did you know?" they asked. I told them I was a dog trainer and then we had an impromptu Q&A. Being that I wanted to continue my ride I quickly answered some of their questions and started to move away. The dog went into full CUJO mode where they continued to explain what was going on. I already knew, smiled and continued my ride. The dog wanted to control my movement; he was not interested in a fun run by my side. The dog's guardians were being ruled by their dog. As long as I stood where he wanted me to stand, things were fine. But when I took it upon myself to move away, he was not. Had I just rode my bike passed them; I have no doubt that I would have had to deal with a large Lab/Border Collie lunging at me. The next incident was one where I also got off of my bike. I was riding a long a path and saw a couple of women up ahead with their dogs off leash. Off leash dogs is not something you like to see when you are on a bike. I slowed and watched where the woman were going to take their dogs. They FINALLY saw me coming and moved away from the path. I got off my bike, both dogs were herding type dogs so I knew they would be more prone to my bike as a trigger. What happened next really shocked me. One of the woman leashed their dog, which was good. The other woman put her dog between her legs and held onto the collar. As I got closer, the dog went so crazy that the woman could barely hang onto her dog. This was direct at me just walking by, I had already got off my bike thinking about what might happen. The other dog was on high alert, ready to pounce when given the chance. Neither of these dogs should have been off leash EVER in public. So, I love my new bike. I will enjoy it whenever I can. Dogs are often triggered by bikes, it is a common occurrence. It is much the same as walking vs. running trigger chase. Many dogs have very strong chase drive; so this is something that a rider must be aware of. Always be prepared to react to a lunge. Always be ready and give yourself more space when riding by dogs. If your dog is not accustom to bicycles or has the drive to chase them; you must take extra precaution. One lunge, even if the dog does not connect; can send a bike rider off of their bike resulting in a serious injury. Keep your dog by your side and hire a positive trainer to help you to desensitize them with bicycles if needed. By desensitizing and counter conditioning, bicycles can be a problem in the past, very quickly. Private - confined to or intended only for the persons and or dogs immediately concerned. Dog - a domesticated canid, Canis familiaris, bred in many varieties. Training - the education, instruction, or discipline of a dog that is being. Private in-home dog training is one of the training services that I offer. The other services are online consultations which is beneficial for those who don't live in my area. But my private in-home is a hands on type of training; highly personalized for you, your family and your dog. This is essentially all about you. Your home, your dog, your training. Training approach is specifically for you and your dog. Training within your home allows me to see environment that you and your dog live in. Enabling to work up a highly personalized training regimen. Training in your home allows me to show you exactly how to train your dog in your day to day. Being in your home allows you to show me exactly what is going on and where. In-home makes it easy for us to walk through a day in the life of you and your dog. We work on a plan that will specifically fit your family and your dog. I love working one on one so to speak; with a family and their dog. It gives me the chance to concentrate on only you. You and your dog that is. It is a great way to implement the whole family into the training. No distractions, very specific training work, hands on demonstrations giving you the confidence to do it yourself. From the moment I arrive at your home until the day that I leave; there is a huge transformation in you, the family and your dog. My job is to train you and the family to train your dog. There inevitably comes the day when I have to say goodbye; and on that day, I have given you all the training to take it from there. Of course there is always the open line of email and phone help when the need arises. Private in-home dog training. I come to your home, your family and your dog to work on your problems. Nice. Harness your relationship, don't choke it. Yesterday Elsa and I were out for our evening walk. We had to cut our path walk short; turn around and head in the opposite direction because of a coyote siting. Thanks to a nice person who was passing by, we were alerted to it's presence. We made our way up to the park and continued our walk there; away from the coyotes. As we entered the park we noticed a little dog doing damage to his tiny neck. The dog's human was oblivious to the fact that she was indeed choking her dog. The little black and furry mix was dying to come to see Elsa. Lunging and diving in attempt to see the lovely Miss Elsa, he was being choked by his collar. The woman on the end of the leash seemed absorbed in everything but her dog as he choked and sputtered. I couldn't help but shudder as I imagined his little neck taking the impact resulting from his actions. People don't realize how much damage can be done by a collar, any collar. Throughout history humans have done a lot of ludicrous things. If we do not take the time to stand back and reconsider the actions that we take; we can continue the senseless acts without change. "Expect Better - and move towards better. If we blindly continue the actions of the people before us without stopping to ponder our behavior, we are not evolving or striving for better. Sometimes those who came before us didn't know a whole lot. Perhaps over time we have learned better and should then do better, right? This is the harness that Elsa wears. Click here to purchase. This harness above is the one I use for Elsa. I got it years ago when Luke was still around. So it was his harness before Elsa's. I love it and it is my "go to" harness. It has a hook up on top and out in front to minimize those who like to pull. Elsa and I head up the hill towards the lake at one of our favorite spots. As we neared the bend a woman stood on other side of a narrow road with two large dogs in one hand and her phone in the other. She kept nervously watching us as we continued. Needless to say I was now watching her and assessing what exactly was going on before continuing any further. She yanked at the dogs over and over again; pulling them in to an inch beside her. It was what she did next that caused me to make the decision to u turn with Elsa. Watching the situation with the woman, dogs and phone carefully; it was obvious that she was not comfortable with us passing by. Trying to balance her phone conversation and two large dogs she then held up one leg and put it in front of the dogs. Okay, that was enough information for me; I did a quick u-turn and head back down the hill, taking our walk in a different direction. Sometimes it's just best to turn around. She was not blocking our way at all but I saw the scenario as an accident waiting to happen. A simple direction change rectified what I saw as a possible situation. As we turned and head the other way I looked back to see the woman loosen her grip on her dogs and continue her walk. So it was a win, win. Coming across someone who looks like they have no control over their dog can be as intimidating as a loose dog running around. It fact, it was a woman who had lost control of her Bulldogs while still on leash that attacked Elsa several years ago. I do not want to be the victim of someone's lack of control over their dog. Either get control of your dog or don't have a dog so large and strong that you can't physically control it. The woman with the two large dogs had communicated to me that she was not confident in her ability to control her dogs. Having both hands available and not trying to carry on a conversation; she may have been quite capable of controlling her dogs. I clearly understood her body language because that's what I do. I read. Not everyone sees communication via body language and it is a big problem. Just the other day Elsa and I were out in a big open field playing catch. A man with a Labrador started approaching. Seeing that he was coming our way, I made a clear communication by moving further down the field. He should have seen this "I don't want to interact," but he didn't. He kept coming so I upped my communication. I abruptly turned and walked away. Nope, he was still coming. It boggles my mind. Finally I leashed Elsa, turned around completely and started walking away. He then called out to see if they could play together. Wow!!!! Canines are far superior to us in the reading body language department. We humans can in fact communicate without ever having to open our mouths. But whether or not the other person we are trying to communicate with can read or not is the question. With camera in hand, my sister and I head out to visit her breeder. Finally after all these years, I was going to meet Dawn; the woman behind all the stories. Sadly I was meeting her after the passing of my sister's much loved Ruby. Turning into the driveway, I scanned the springtime terrain that was trying to escape the winter cover. The ground was very wet and muddy; giving off the very familiar smell of spring. Even though April is a messy time of year in Canada; it carries with it the hope of sunshine and warmer temperatures of summer to come. Getting out of the car, I stepped over a big puddle to avoid getting a soaker (foot submerged in water). We head towards the house where we got our first sneak peek at the Tollers who were enjoying the outdoors in a fenced area off to the left. The door opened and we were welcomed in with open arms and hugs. Dawn and my sister (Bonnie) are family; family through the mutual love of a very special dog. After our welcome we sat in the living room and waited for the releasing of the hounds. Excited barking could be heard before a sea of red charged through the doorway and headed our way. Three Tollers (Nova Scotia Duck Tolling Retrievers) and a small but mighty Toy Poodle welcomed us to their home. Immediately after our welcome the retrieving started. Tollers love to retrieve. Our conversation began with who was related; where everyone came from and breeding. Dawn then opened a book that held a wealth of information. I was amazed as she sifted through the family (Toller) records with the topic turning to Ruby's siblings. Two siblings remained and Dawn shared the history of the rest. It amazed me that she kept track of each and every family member (Toller) who had left her charge over the years. The families who had adopted a Toller from Dawn were indeed family. It is rare to find someone who is as passionate about dogs as I am but Ruby's breeder (Dawn) is most definitely that and then some. I have not met a more conscientious breeder. These are the type of breeders we need to support. We talked about extensive health testing, health, breeding and temperament testing in detail. I learned a lot as Dawn shared her Toller mission with us. Throughout our discussion Dawn shared a great deal of information that she had learned over the years. We talked about a wonderful company that focuses on changing the future of dogs called Avidog. She also explained Nomographs, which I have never heard of. Nomographs are done by testing a mother's blood to see what level of antibodies are being passed to her puppies in her colostrum. This lets a breeder know when it is best to vaccinate puppies. This explains why puppies given vaccinations too early can get ill. Fascinating. Between the canine conversation, I tried to capture a few photos of the dogs. It was clear that the little Toy poodle was the boss. Easily outweighed by all the red dogs she was confident and happy to rule the roost. As our visit neared the end we head outside and toward the kennels. Dawn also runs a boarding kennel. We were going to meet Ruby's brother who is one of the two siblings remaining from her litter. As soon as we set eyes on him, it was impossible not to see the resemblance. Bonnie knelt down to meet the old man; a link to her much loved Ruby. It was a moment; one that most of us never get to experience. Meeting this old man was an honor for me. Before we left we were lucky to meet the future of Dragonluck kennels. The new members who will continue the legacy of filling the position of much loved family members with their offspring. As we drove away, back down the driveway and head for home we reflected on our visit. This is what a breeder should be. Dawn has a wealth of knowledge, a caring heart for dog and human; with a drive to do better and desire to know more. This is what you want to find when you are searching for a breeder; no matter what breed you are looking for. This is who we should be supporting.